In 1968 Andy Warhol, said "In the future, everyone will be world-famous for 15 minutes." I think I may have gotten 7 minutes of that 15 the other day. Well, maybe not 7 - probably less. It kind of all depends. I'd better start from the beginning. Mid-December 2012 - I get an email in my Museum account from a researcher associated with a new documentary show that will be airing on the travel channel. (Since the show has not been announced, I've been asked not to mention the title, and just to be on the safe side, I'll give everybody involved with this little tale an alias). Anyway, this researcher (I'll caller her Lindsay) wonders if I would be able to be a guest on the show to talk about the crash of the Hindenburg and the possible reasons the disaster occurred. If I'm interested she will set up a time when I can talk on the phone with a producer of the show. Now for people unfamiliar with the Hindenburg's story, I'll point you to my article on it (The Mystery of the Hindenburg Disaster). Now I know quite a bit about the Hindenburg and airships, in fact right now I'm working on an article about The Norge, the first dirigible to fly over the North Pole. Still, there are plenty of Hindenburg experts out there who know the story better than me, so I'm not exactly sure why they want me, but I figure, nothing ventured, nothing gained. I send a message back to Lindsay telling her that we can set up a time where I can talk on the phone. A few days later on a Saturday afternoon, I get a call from Susan, the producer. I've pulled out all my reference materials on the Hindenburg and they are spread across the coffee table in case she asks me a fact or figure I can't remember off the top of my head. The conversation goes on for almost an hour with me answering her questions. In the end she thanks me and we hang up. Given my garbled answers and awkwardly constructed replies, I figure I'll never hear from her again. A week later, I'm surprised to get a call from Susan. 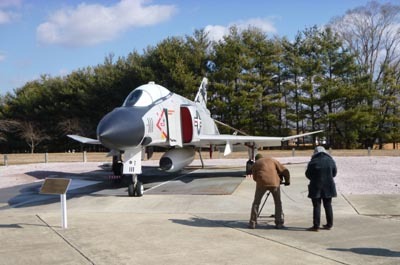 She wants to run a few dates by me when I can come out to Lakehurst Naval Air Station (where the Hindenburg went down) to shoot at the memorial there. Fortunately, this isn't more than a couple hours drive from my house and since the college is on winter break, so my schedule is pretty open. The real problem will be getting onto the site of the crash itself to film the monument located there. Lakehurst is a military installation security is really tight ever since 9-11. Nothing happens, however, until after the holidays are over and school is starting up again. I tell Susan on a later call this means that my only free days are Wednesdays. Susan calls and asks if February 6th - a Wednesday - works for me. It does, so she will check with the Navy and get back to me. 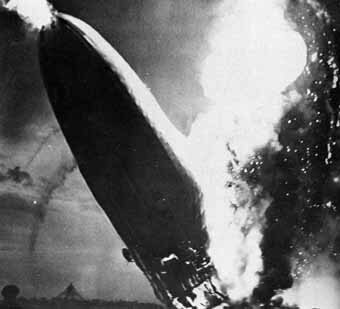 The object of the segment: The Hindenburg in flames. A few days later I get another call. We are on for the 6th and she wants to know if I can meet them at the base's main entrance at 9AM. I agree and Susan tells me her assistant producer, Elaine, will send me wardrobe guidelines. The wardrobe guidelines arrive: "No ties or bow ties, no sweater vests, no white or cream, no patterns. Bring a VARIETY of options to the set so we can see what works best for the camera - button downs in neutral (like dark grey or blue) or jewel tones are best." This actually eliminates most of my current wardrobe, which really isn't all that extensive in the first place. Everything I have either has a pattern or is white or cream. I finally find four button down shirts that might work: dark green, slightly lighter, dark green, a medium rust color and finally a dark gray with a tiny pattern which is almost invisible. Worrying me more than the shirts are what I can wear for a jacket for the outside shots. I have a brown leather one that I love. It's a dead ringer for the one Indiana Jones wears. The problem is that it's more than ten years old and in such shabby shape that even that sartorial challenged archeologist would refuse to wear it. I've wanted to replace it for years, but can't find another one quite like it. In desperation one evening I go out and my wife helps me find a black leather, bomber style jacket. Bomber jacket - airship story, I guess it should work. The evening before the shoot I decide that it makes sense for me to put together a notebook with everything I know about the Hindenburg story, especially all the relevant facts and figures that I'm likely to forget. I find a little leather notebook that I like - it reminds me of the one Indy's father carries in The Last Crusade - and fill it with every item I think that might come up. I also glue in diagrams such as the flight path of the airship over the field on its approach and various sketches showing the internal structure. I don't know if I will actually refer to this at all, but having it in my pocket during the shooting will be reassuring. February 6th - 9AM: I've been parked in front of the visitor center at Lakehurst for 15 minutes. My cellphone rings. It's Susan. They are pulling into the parking lot and ask what kind of car I'm in. I tell them a black KIA. I see them pull up in a white van. We quickly shake hands. The crew consists of Susan, the producer, Elaine, the assistant producer, Michael, the cameraman and Stuart, the sound guy (Again, all aliases). Susan is really nice, but she looks tired. I find out later that she and Elaine just flew in last night from a 14-day trip to the west coast where they were filming other segments for the show. Apparently being a documentary filmmaker for a TV channel can be an exhausting profession. We go into the visitor center where we meet our assigned press rep., Lt. Smith. She's blond and around 25 years old. She gets our names, then tells us that we will need to have our vehicles searched before we can drive them onto the base. I hop into my car and follow her to an open canopy area behind the visitor center where a stern looking security officer instructs me to get out of the car, open every door on it (including the glove compartment and the console storage) and step away. Another officer brings a German shepherd around to sniff the car out. After the dog approves of my choice of conveyance, I am told to drive it out of the way. The film crew's van is next. This takes a lot more time as they have boxes and boxes of camera equipment that must be checked. 9:30AM - We finally follow Lt. Smith onto the base and stop at hanger #1. This is a huge building that was built in the years just before World War I to house gigantic dirigibles. It's 806 feet long, just two feet longer than the Hindenburg. You could put two and half football fields on the floor of this thing and still have space left over for a couple of basketball courts. The hanger also has some smaller rooms on the side including an area the Navy gives over to the Historical Society. One of the senior members of the society (I'll call him "Fred") drives out with us to the actual crash site on a windswept field perhaps � of a mile from the big hanger. In the center of the field is what we are actually here to film: The Hindenburg Disaster Memorial. It reminds me of a patio about 60 feet long and ten feet wide positioned where the Hindenburg's control cabin came to rest after the crash. It has a vaguely coffin shape. I don't know if the designers actually intended that or if it was just a coincidence. 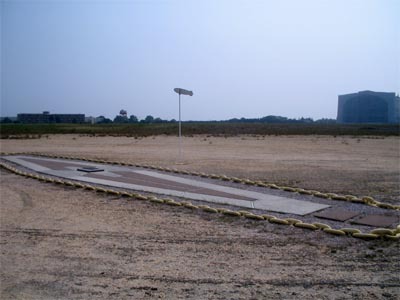 In the very center of it is a marble slab, and on that is mounted a metal plaque commemorating the 36 lives lost in the disaster. 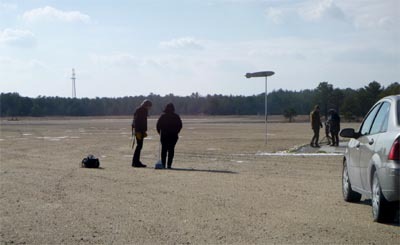 While waiting for the crew to set up the camera and brush a tiny layer of snow off the monument, I pull out my notes and orient myself so that I know from which direction the Hindenburg approached from, how it circled the field, and finally, which direction it was facing when it crashed. Susan wants me to do a "walk and talk" around the monument explaining what happened with the airship here. I feel good now that I've gotten myself properly oriented so that I know how to present things. My confidence is suddenly shattered, however, when Fred announces to everybody that the airship crashed facing the opposite direction from what my notes say. If I can't get this right, what else have I gotten wrong? Stuart, the sound guy, comes over and puts a wireless microphone on me. The wind is whipping around us and I have my doubts about whether he will be able to get anything useable. I hope it works out. I think the "walk and talk" will look great as long as people can hear me. To say it is cold out here is an understatement. It's not so much the temperature. It's actually above freezing and the sun is popping in and out of the clouds, but the heavy wind makes it feel like it's sub-zero. Fred remarks that it is always cold and windy out here. Some of the other guys from the historical society come out and join us. I get introduced to Jim. I immediately warm to him as he's about my age and has a deep enthusiasm for the history of airships. We talk for a while about the different theories of what caused the ship to crash. Without realizing it he also boosts my confidence when he tells me that the airship crashed facing the opposite way from what Fred just stated. Apparently my interpretation of the landing pattern was correct after all. He also points to where the camera crews and reporters where standing when the crash occurred, a fact that I decide to incorporate into my "walk and talk." We start the "walk and talk." The cameraman has me walk onto the memorial from the field and stop on my "mark" - a place the Susan has designated on the ground with a pebble. I then turn and describe the approach the ship made and how it was hanging above this location at a height of 200 feet when the fire broke out. We do this over several times. There isn't any script, so I'm pretty much winging it and sometimes I stumble and it's a do over. To make things even more difficult, Lt. Smith interrupts me after the first time and tells me that I can't refer to the place as "Lakehurst Naval Air Station", which it was when the Hindenburg crashed in '37. I must use the current tongue-twister name of "Joint Base McGuire-Dix-Lakehurst." Wedging this successfully into my talk requires a few more takes. Complicating things even more is that after the first run the sound guy tells me not to turn when describing how the Hindenburg's flight path goes behind me as this exposes the mic to the wind and he can't hear me. Despite all these restraints, however, Susan, who has her head tucked into a portable monitor strapped to her chest, finally approves a version of the talk. She then tells me to go warm up in my car til I'm needed again. Instead I actually go over to Jim and we kibitz a bit more about airships and what the history of aviation would have been like if the disaster never had occured. After a while, however, the cold is just too intense and I climb into my KIA. I'm just starting to get warmed up when I see the assistant producer, Elaine, waving to me. They need me for my "hero" shot. This is the only time I get to actually look into the camera. I don't need to do much, just stand on the monument and look thoughtful. The cameraman takes the shot a dozen different ways, panning on to me from the left, right, up, down and some other ways I can't even remember. Finally, I return to the car again and warm up, only to go back out. They've relocated the camera to the roof of the van to get a high angle shot and they want me to do the "walk and talk" again so they can get a distant view of it. The nice thing about this is that I'm not wearing the mic and I can babble on about anything I want. They just need my hand motions. They will match this up with the audio I did earlier. I do it once, but Mike informs us that we have to do it again. Elaine sat down on the edge of the van causing the camera to rock. She apologizes and Mike says not to worry about it. He's pretty easy-going. I don't mind it either because it makes me feel like I'm not the only one screwing up and causing them to do multiple retakes. 11:30 AM - We finally finish up at the field and head back to Hanger #1. The crew needs shots inside, outside the hanger, plus a few of some aircraft on display at a little park across the street. We also explore the small museum that the historical society runs. The room is only about 20 feet by 20 feet, but it's packed with memorabilia. There are huge models of dirigibles and blimps hanging from the ceiling. The Hindenburg and each of the four dirigibles operated by the U.S. Navy have their own cases full of artifacts. Susan sees a chunk of the remains of the airship U.S. Akron, which was lost at sea in 1933, and thinks it would make a great segment for another show. I agree. 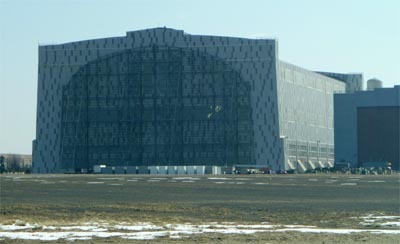 The interior of the hanger is almost unbelievable. While we're waiting for the crew to shoot some more "B roll" - background shots - Jim shows me the control car replica that was built for the 1975 film The Hindenburg. He tells me that last year a documentary crew came by, brought in some actors dressed in uniforms, and used it to recreate the disaster. 12:35 PM - They crew is done with their shots around the hanger and other parts of the base and we leave. They still need to do a straight question and answer interview with me, but the base had no place that's appropriate for that so we need to go to a hotel and rent one of their meeting rooms. First, however, they need to get some more "B roll" around the town of Lakehurst itself. Susan kindly tells me I can drive over and wait at the pub where we will have lunch, but I decide to tag along. One of the reasons I decided to do the interview was that I wanted to see just how a segment like this is put together. Besides, the battery on my cell phone is getting weak and I'm afraid of losing contact with them. 1:40PM - We finally get to eat. Everybody seems happy with the pub Susan has chosen. Elaine, representing the production company, is buying. I order a cheddar-bacon burger with sweet potato fries. As we await the order I pepper the crew with various questions. Susan tells me she likes working on this new series because she gets to pick who she does her interview with, because sometimes she has to interview the ranking person at whatever institution they are visiting and those people don't always make the best interviews. This makes me feel better because she must have decided on the phone that I would be a better interview than some other possibilities. I also ask her how much of what they shoot with me today will get into the seven-minute segment as compared to having somebody do a voice-over with historical shots. She replies, "not to put the pressure on you," but it depends on how good an interview I give. My questions reveal that life on the road with one of these shows is draining. I always thought that it would be fun to be the host of some mystery or science show on one of these channels, but even doing this gig for a day I see how much work it would be. They do a month of straight of shooting and each day runs 10 or more hours. Then they are back to the office for a month researching more stories. Yes, sometimes you get to travel to exotic locations (Our cameraman had just come back from shooting in Hawaii) but beyond the particular places you are photographing, you only get to see your hotel room. 2:45 PM - We finally get to the hotel. The crew starts setting up for the interview. Susan tells me this will take almost an hour. In the meantime I'm sent out to my car to get my shirts. They pick out one of the green ones. After I change, I sit and watch them put things together. Behind the chair I will be sitting on they stretch a plastic sheet that causes the background to look a little fuzzy. They also set up two stands with boom arms that hang almost over the chair. One holds a microphone and the other a lamp. Stuart also sets me up with a wireless mic that tucks into my collar. Behind the sheet of plastic they get one of the small tables from the conference room and stack some crystal glasses on it. By lighting that from the side they hope to give the shot an interesting background. When Mike looks through the camera, however, he notes that it looks like a pile of beer cans. They rearrange the glasses to give them a different appearance. Elaine sits me down and starts doing my makeup. She asks me if I mind doing the interview without my glasses. This will make it easier to light me. I say that's no problem as long as I don't have to read anything at a distance. 3:35 PM - We start the interview. Susan asks me how I would like to be referred to on the show. Usually I use the term "Curator," however I want to make it clear that I'm not connected with the museum at Lakehurst. I decide that simply "Historian" would be best. The interview actually reminds me of one of those police interrogations you see in the old movies. It's not that Susan isn't being super nice about asking me questions. She encourages me to think of this as bring similar to the conversation we had on the phone. Or maybe like talking to a student. The problem is that during most conversations I'm not sitting in a dark room with a light shining in my face as four people stare at me and I have to worry about sitting with my feet flat on the floor while keeping my upper body in the frame of the picture. This makes things slightly more difficult. Susan assures me, however, that I will "warm up" after a while. The interview also reminds me of an interrogation because I'm answering the same questions over and over again. Half the time the reason is that partway through my answer I stumble and we have to do it over. The other half is because the room we rented is not ideal. The street outside is noisy and in the hallway the elevator is dinging every few minutes. This means even when I give a perfect answer, often I have to do it again just for safety. Elaine is sent out into the hall to quiet people down. She puts up a sign on the door that says, "Quiet Please, Filming!" However this just causes people to talk more as they want to know what's being filmed. I'm impressed that Susan has gotten so well versed in the subject of the Hindenburg. She has all my remarks from the phone conversation written down plus other information she's found out. Again it's a bit like a police interrogation. "Mr. Krystek, on your testimony last week you said that the Hindenburg was as long as four 747s! But now you say that it was only as long as three!" I admit that sometimes I'm guilty of screw ups like that, but mostly because I did some additional fact checking in between. The experience garners in me a lot of sympathy for anybody being interviewed. It's really hard to come up with good clear answers on the fly even when you know your subject well. I can see how when the elements are edited together in the end you might seem to be saying something that you really didn't mean. Not that Susan is trying to do that at all. I'm just afraid that the editors, who don't know the story as well as she does, will cut this together and it might not come out like it should. 5:45PM - The crew packs up and I say goodbye. Elaine gives me some gas money and I suggest a future story idea to Susan, telling her I will email the relevant information to her. I can see why she looks exhausted. She left her apartment at 5AM to pickup her crew and she won't be getting home to NYC until at least 8 o'clock. The whole experience has given me real insight into how these types of shows are put together. I often watch Mythbusters, Samantha Brown or any of those documentary-type shows and think what a great job that would be. The truth is that it's a lot of work with long hours and little time at home. After seeing this would I really want to host a show on the Travel Channel if I had the chance? Well, the truth is probably yes. Update: Since this article came out the show has premiered and the episode broadcast. The show was Monumental Mysteries and the episode was #5. Unfortunately the walk and talk didn't make into the final cut. A link to part of the segment on the Travel Channel website is here. Copyright 2013 Lee Krystek. All Rights Reserved.